Some programs such as Google Maps offer services that use your computer's location information, but Apple's privacy change was made primarily for iOS devices including iPhones, iPad and iPods. These devices offer a slew of applications that want to use your location data for everything from Foursquare check-ins to geotagging photos . Although Apple's policy change was recent, iPhone applications have been able to access your iPhone's precise location information since iPhone OS 3 .
services that help you understand how your location data is being used. As was the case with iPhone OS 3, whenever an iPhone application wants to use your location data you must explicitly authorize it do so. 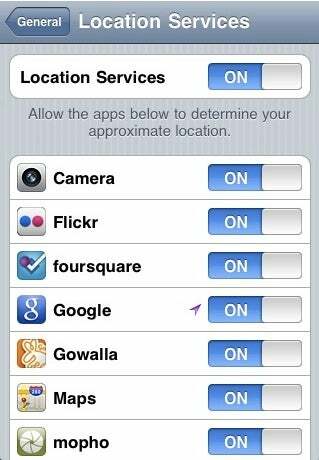 In iOS 4, after that first-time authorization, a small arrow appears on the top right of your iPhone screen every time your location information is being accessed by an application. Overall, Apple appears to be doing a pretty good job with your location data; however there have been some criticisms over the new policy. Apple does not specify, for example, whether or not it will still track your location even with the Location Services global control turned off. It's also not clear how long Apple intends to store your location data, and what kind of safeguards it has in place to protect its database of location information. I've asked Apple for clarification on these points, and will update this post once I hear back from the company. Sprint, for example, was getting so many location requests from police that it set up what is "essentially a Web portal for law enforcement to go to, to ping cell phones to find their location based on GPS ," Electronic Frontier Foundation Senior Staff Attorney Kevin Bankston told OTM. Over one twelve month period Sprint's cell phone location data site had been used eight million times by law enforcement officials, according to Bankston.